This hot red chocolate sponge is wonderfully light and balanced. 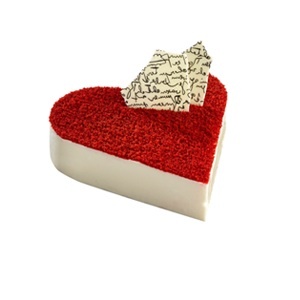 Offset by a creamy cheese icing, with a hint of orange zest this chic sweet is decorated with a romantic white chocolate love letter. 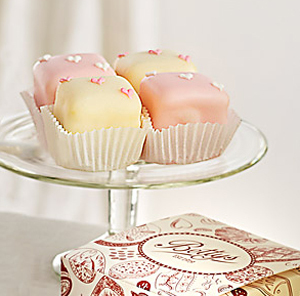 Bettys classic Fondant Fancies are made from dainty Genoese sponge cake and are filled with buttercream and raspberry preserve. 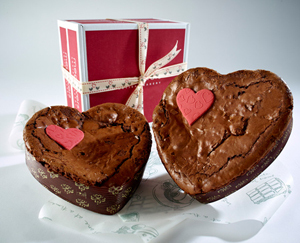 Each is individually decorated with an iced heart design for Valentine’s Day.www.bettys.co.uk and order online or in their shops. 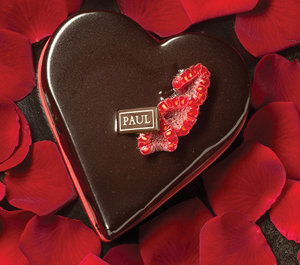 Roses are red, violets are blue, we’ll hand-iced this biscuit just for you. 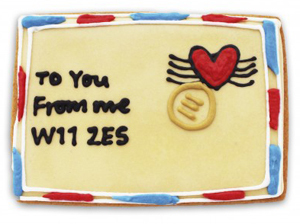 Send Biscuiteers your personal message and they’ll ice it onto the biscuit in their very best handwriting. www.biscuiteers.com.